A turn-based strategy game with RPG elements taking place during WWII. The players fight Nazi troops that control beings from other dimensions, inspired by the works of H.P. Lovecraft. Achtung! 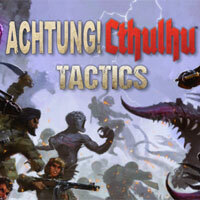 Cthulhu Tactics is a turn-based strategy game with RPG elements developed by the British Auroch Digital. We first heard about the game combining WWII with Cthulhu Mythos back in February 2018, when a Kickstarter campaign was started to fund the final stages of development of the game. Achtung! Cthulhu Tactics takes players to an original Achtung! Cthulhu universe created in 2013 in a form of classic tabletop RPG and a series of books, radio plays, and a miniature game. The player is commanding a squad fighting behind the enemy lines on the WWII fronts. One slowly discovers the terrifying secrets hidden by the Nazis. German scientists and occultists have encountered creatures taken straight from the Cthulhu Mythos and allied with them in their plans to dominate the world. At first glance, Achtung! Cthulhu Tactics resembles the popular XCOM series. The game described here, however, uses a number of systems that distinguish it from the competition. Players observe the action from a top-down perspective, and the characters controlled by the players move in turns. Battlefields feature a number of elements known to the fans of the genre, such as covers and unit’s movement range. The light and darkness system is an innovation in this genre. When moving around well-lit areas of the board, one gets an advantage over enemies and is able to stop their attacks more efficiently. During the game, players control characters they created themselves, that feature unique skills unlocked by acquiring experience points. A balanced team is further rewarded. Should one's protégés handle combat extremely well and quickly kill the enemies without sustaining much damage, the game activates additional stat bonuses that might significantly affect the outcome of the mission. One has to remember, though, that the heroes fight a difficult to comprehend threat out of this world. This is represented in the madness system that is very well known to all productions inspired by the Lovecraft's works. The longer one of the characters faces monsters from another dimension, the greater the probability they will lose their minds and become useless (even by joining enemy forces). Achtung! Cthulhu Tactics is based on a 3D graphics engine. The developers decided to implement quite realistic visuals and neutral colors.